KAMPALA – Police have confirmed that the Aruu County Member of Parliament Odonga Otto has been transferred to Kampala for further treatment. The MP was on Friday morning involved in a motor accident at Katugo, Nakasongola District. Police said the MP was rescued by the parliament ambulance from Bishop Ceaser Asili Hospital in Luweero where he had been admitted prior. Police leadership on social media said Otto who was driving his Land Cruiser registration number UBA 832S rammed into a trailer registration number UAV 837 J/UAD991Q, which had overturned on the highway. “Police this morning rushed to the scene at Katuugo, Nakasongola where Hon. Odonga Otto got involved in an accident this morning. His Prado reg. number UBA 832S knocked a trailer reg. number UAV 837J/UAD 991Q that had overturned on the high way. Police are managing the scene,” the police wrote. 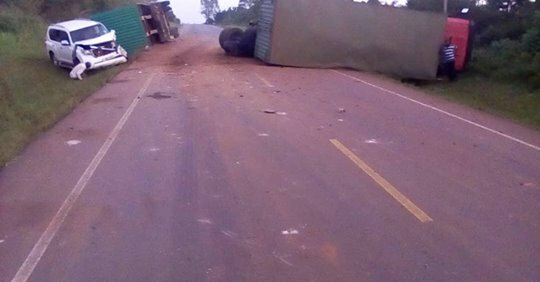 However, according to Police Chief Political Commissar Mr. Asan Kasingye, the legislator was not the one driving, but his driver was waved down by the police officers yards before the accident scene in vain. “This was human error. The driver was flagged down by the Police. But, he drove on. They are out of danger. Let’s wish them a quick recovery,” Kasingye said.